Central Lombok - photos on the top of the hill, relax in a stretch of white sand beach or snorkel in Lombok was outstanding. 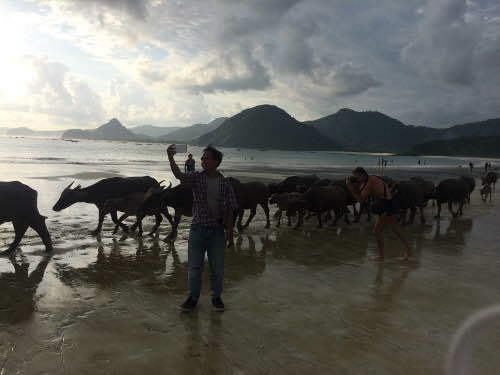 Unique, try selfie with buffalo on the beach! This is the beach Selong Belanak in Central Lombok regency, West Nusa Tenggara. White sandy beaches and crowded by tourists who are on vacation. One again, they came there not only humans but also buffalo! 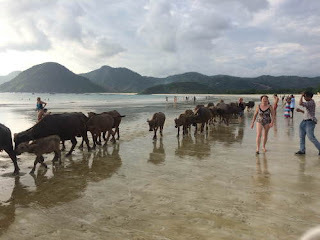 Precisely when the late afternoon, you will see a herd of four-legged brown animals were herded by the herdsmen. That is like detikTravel see, at the weekend. Apparently, a crowd of tens of buffalo are herded back into its cage after looking for grass to eat. 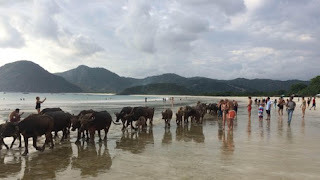 Well, buffalo passing scenery on this coast turned out to steal the attention of tourists. They were not disturbed, even enthusiastic to see it. Not a few, they shoot all the buffalo buffalo-selfie together. Cekrek! Bak models sauntered down the catwalk, the buffalo have successfully turned a short view of the tourists from the beautiful beach. They were sunbathing, practicing surfing, stopping briefly to mix and match a swarm of these animals with a silver-colored beach where the water is exposed to sunlight. Yes, when else messing around on the beach with buffalo. For those of you who are or will be a vacation to Lombok, try to come to the beach Selong Belanak and feel the unique experience. 0 Response to "Unique in Lombok, Selfie with Buffalo in Beach"